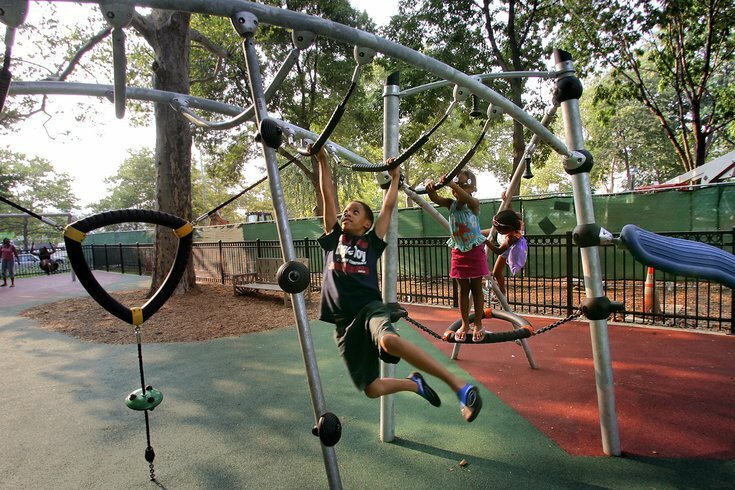 Children play on modern-design playground equipment at Franklin Square. Mayor Jim Kenney's Administration is moving forward with plans for a $500 million project to renovate parks and libraries in Philadelphia, but funds will not be available until a court challenge on the city's newly-enacted soda tax is resolved. On Thursday, Kenney addressed City Council to propose a $4.4 billion budget for the 2018 fiscal year. Despite litigation from the soda industry over the sugary beverage tax, Kenney presented bills that use funds generated from the tax to advance the seven-year initiative. “These ordinances are a result of a partnership with City Council and a shared commitment to making our city’s public spaces better for all Philadelphians and reaching our goals for diversity and economic opportunity,” Kenney said. Dubbed the Rebuilding Community Infrastructure, or Rebuild, the city plans to borrow $300 million, use a $100 million donation from the William Penn Foundation and secure another $100 million in state and federal grants to fund the project. The money will be spent to revitalize parks, recreation centers, playgrounds, and libraries across the city. The proposed bills would create a governing structure for the project, which includes issuing $300 million in bonds. However, the bonds won't be approved until the soda tax challenge is fully resolved because that process uses money that is generated by the soda tax. In December, a lawsuit filed by the soda industry in Philadelphia Common Pleas Court was dismissed in its entirety. However, an appeal to Pennsylvania Commonwealth Court is still ongoing. The soda tax was passed in June and went into effect on Jan. 1. For the first fiscal year, city officials project $91 million in revenue, only part of which is earmarked for the Rebuild project. Despite that delay, the city will move forward this summer as scheduled with the first phase of the Rebuild project with existing funds. Officials are currently evaluating potential sites to receive funds. Councilmembers also expressed support for project's outlook, which includes partnerships with non-profit organizations to oversee efforts. “The proposed governing structure allows for Rebuild to get done the smart way – efficiently, on-time and in keeping with all the goals of the initiative,” Councilman Bobby Henon said. Each city park, recreation center and library designated as Rebuild sites will receive between $50,000 and $13 million for renovations.